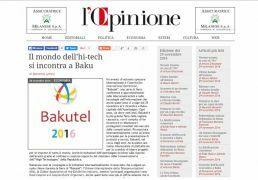 Italy-based L'opinione newspaper has published an article by journalist Domenico Letizia highlighting BakuTel-2016, the 22nd Azerbaijan International Exhibition and Conference on Telecommunications and Information Technologies. Headlined "The world of high technologies meets in Baku", the article describes the event as the largest exhibition of its kind in the Caucasus region. The article hails the fact that more than 200 European companies participate in the event, including Azerbaijan, Turkey, Israel, Italy. The article also lauds the Azerbaijani government's attention to communications and high technologies sector. It says Italy-Azerbaijan Chamber of Commerce encouraged Italian ICT and high-tech companies and organizations to participate in the event. The article says that projects as "Audio library for visually impaired children" and "Digitalization of museums" grabbed visitors` attention at BakuTel-2016. The article also points to the fact that numerous international exhibitions held in Azerbaijan receive support from the UN, World Tourism Organization and International Telecommunication Union.